Additional offering or prayer. Besides the regular morning and afternoon sacrifices offered in the Temple, the Law provided for additionalofferings to be brought on Sabbaths, New Moons, the three festivals, New-Year, and the Day of Atonement (Num. xxviii.-xxix. ; see Sacrifices). These were called "the additional sacrifices," and were brought after the regular morning offering (Yoma 33a). The Musaf or additional prayer was introduced to take the place of these sacrifices (Ber. 26b; see Prayer). 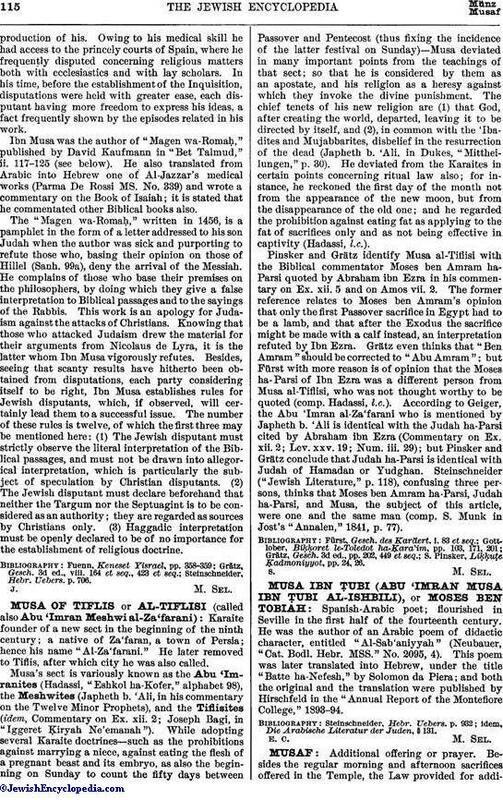 The earlier tannaim, regarding the Musaf service as an integral part of the communal prayers, were of the opinion that it should be read only when one worships with the community (or with the representatives of the community, "be-ḥeber 'ir") (Ber. 30a; Yer. Ber. iv. 6). The later rabbis, however, made the Musaf service obligatory upon every individual, and attached to it the same importance as to the regular morning service (Ber. 30b; Shulḥan 'Aruk, Oraḥ Ḥayyim, 286, 2). It is customary to read the Musaf prayer soon after the reading of the lesson from the Torah for the day, which follows the morning prayer; but it may also be read at any time during the day, although he who out of negligence postpones it to later than the seventh hour of the day is regarded as a sinner ("poshea'"; Ber. 26a, 28a; Meg. 20b; Maimonides, "Yad," Tefillah, iii. 5; Oraḥ Ḥayyim, 286, 1). While it is not permitted to eat a full meal before Musaf, one may taste some fruit or bread after reciting the Ḳiddush (Ber. 28b; "Yad," l.c. vi. 4; comp. "Kesef Mishneh" ad loc. ; Oraḥ Ḥayyim, 286, 3). As in all other cases, in the tefillah for Musaf the first three and the last three benedictions are constant. Between these is inserted another benediction in which the selection from Numbers setting forth the additional sacrifice for the day is included (in the Sephardic ritual this is included only in the Musaf prayers for Sabbath and New Moon; comp. R. H. 35a). In the Musaf for the New-Year three series of benedictions are added, which are known by special names, "Malḳiyot," "Zikronot," and "Shofarot." The chief characteristic of the Musaf tefillah is the emphasis which is laid upon the restoration of the Temple and of the sacrificial cult. The Musaf as well as the morning prayer is most frequently repeated in full by the ḥazzan (R. H. 34b; "Yad," l.c. ix. 13; Oraḥ Ḥayyim, 286, 2, Isserles' gloss). In some congregations, however, especially among the Sephardim, the ḥazzan begins the first three benedictions aloud with the congregation; the middle benediction is then recited in silence; and then the ḥazzan reads the last three benedictions aloud with the congregation. Such variation, however, is not made on holy days. The Priestly Blessing is given by the kohanim at the conclusion of the Musaf service (see Blessing, Priestly). The Musaf service is introduced by the recital of "half Ḳaddish" by the ḥazzan. The Musaf tefillah for the Sabbath, after the three regular benedictions, commences with a composition the initial letters of the first twenty-two words of which run in the inverted order of the Hebrew alphabet (comp. Maḥzor Vitry, ed. Hurwitz, p. 99, where a peculiar reason is given for this; in the Sephardic ritual this prayer reads somewhat differently; comp. Dembitz, "Jewish Services in Synagogue and Home," p. 149). The selection from Num. xxviii. 9-10 is then read; and the blessing is concluded with a short prayer for those who observe the Sabbath, followed by the prayer commencing with the invocation "Our God and the God of our fathers," common to all the services of the day. On New Moons the Musaf contains a prayer expressing regret for the discontinuance of the sacrificial cult and hope for its restoration, the quotation from Num. xxviii. 11, and a prayer for a blessed and happy month. The first prayer is much changed when New Moon falls on a Sabbath, and there are also some variations in the last, while the quotations from Numbers for both Sabbath and New Moon are read. 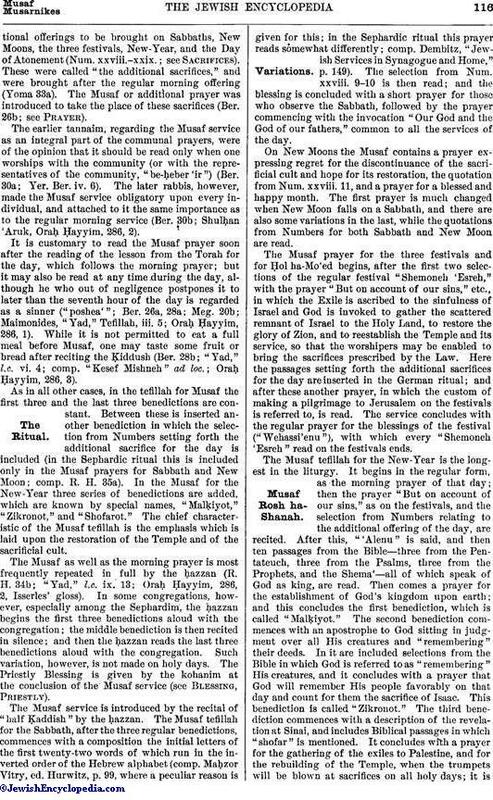 The Musaf prayer for the three festivals and for Ḥol ha-Mo'ed begins, after the first two selections of the regular festival "Shemoneh 'Esreh," with the prayer "But on account of our sins," etc., in which the Exile is ascribed to the sinfulness of Israel and God is invoked to gather the scattered remnant of Israel to the Holy Land, to restore the glory of Zion, and to reestablish the Temple and its service, so that the worshipers may be enabled to bring the sacrifices prescribed by the Law. Here the passages setting forth the additional sacrifices for the day are inserted in the German ritual; and after these another prayer, in which the custom of making a pilgrimage to Jerusalem on the festivals is referred to, is read. The service concludes with the regular prayer for the blessings of the festival ("Wehassi'enu"), with which every "Shemoneh 'Esreh" read on the festivals ends. The Musaf tefillah for the New-Year is the longest in the liturgy. It begins in the regular form, as the morning prayer of that day; then the prayer "But on account of our sins," as on the festivals, and the selection from Numbers relating to the additional offering of the day, are recited. After this, "'Alenu" is said, and then ten passages from the Bible—three from the Pentateuch, three from the Psalms, three from the Prophets, and the Shema'—all of which speak of God as king, are read. Then comes a prayer for the establishment of God's kingdom upon earth; and this concludes the first benediction, which is called "Malḳiyot." The second benediction commences with an apostrophe to God sitting in judgment over all His creatures and "remembering" their deeds. In it are included selections from the Bible in which God is referred to as "remembering" His creatures, and it concludes with a prayer that God will remember His people favorably on that day and count for them the sacrifice of Isaac. This benediction is called "Zikronot." The third benediction commences with a description of the revelation at Sinai, and includes Biblical passages in which "shofar" is mentioned. It concludes with a prayer for the gathering of the exiles to Palestine, and for the rebuilding of the Temple, when the trumpets will be blown at sacrifices on all holy days; it iscalled "Shofarot." During the repetition of the prayers by the ḥazzan the shofar is sounded at the end of each of the three benedictions (R. H. 32a, b; "Yad," Shofar, iii. 7-10; Oraḥ. Ḥayyim, 591, 2). In olden times only "'Alenu" and the last part of the first benediction were read by the congregation, the ḥazzan being relied on for the rest (comp. 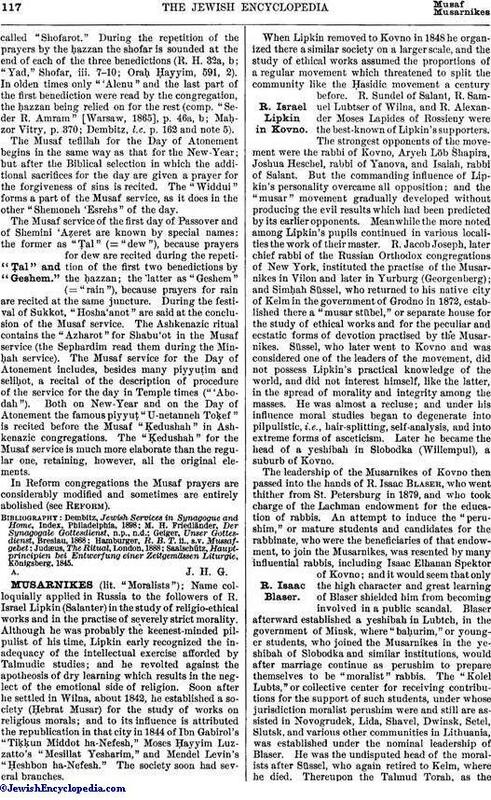 "Seder R. Amram" [Warsaw, 1865], p. 46a, b; Maḥzor Vitry, p. 370; Dembitz, l.c. p. 162 and note 5). The Musaf tefillah for the Day of Atonement begins in the same way as that for the New-Year; but after the Biblical selection in which the additional sacrifices for the day are given a prayer for the forgiveness of sins is recited. The "Widdui" forms a part of the Musaf service, as it does in the other "Shemoneh 'Esrehs" of the day. The Musaf service of the first day of Passover and of Shemini 'Aẓeret are known by special names: the former as "Ṭal" (= "dew"), because prayers for dew are recited during the repetition of the first two benedictions by the ḥazzan; the latter as "Geshem" (= "rain"), because prayers for rain are recited at the same juncture. During the festival of Sukkot, "Hosha'anot" are said at the conclusion of the Musaf service. The Ashkenazic ritual contains the "Azharot" for Shabu'ot in the Musaf service (the Sephardim read them during the Minḥah service). The Musaf service for the Day of Atonement includes, besides many piyyuṭim and seliḥot, a recital of the description of procedure of the service for the day in Temple times ("'Abodah"). Both on New-Year and on the Day of Atonement the famous piyyuṭ "U-netanneh Toḳef" is recited before the Musaf "Ḳedushah" in Ashkenazic congregations. The "Ḳedushah" for the Musaf service is much more elaborate than the regular one, retaining, however, all the original elements. In Reform congregations the Musaf prayers are considerably modified and sometimes are entirely abolished (see Reform). Saalschütz, Hauptprincipien bei Entwerfung einer Zeitgemässen Liturgie, Königsberg, 1845.